Governor Andrew M. Cuomo today announced an historic $13 billion plan to transform John F. Kennedy International Airport into a modern 21st century airport anchored by two new world-class international terminal complexes on the airport's north and south sides. This record investment — including $12 billion in private funding — advances the Governor's vision for a unified and interconnected airport system with best-in-class passenger amenities, centralized ground transportation options and vastly improved roadways that collectively will increase the airport's capacity by at least 15 million passengers a year. "While leaders in Washington talk about investing in infrastructure, we're actually doing it at historic levels and the transformation of JFK Airport into a 21st century transportation hub will ensure New York remains the nation's front door to the world," Governor Cuomo said. "This historic investment to modernize JFK Airport and the surrounding transportation network will not only ease travel through this major hub, but it will ensure JFK joins the ranks as one of the finest airports in the world." "We know how powerful investing in infrastructure can be as a boost to our economy and a driver of job creation," said Lieutenant Governor Kathy Hochul. "Here in New York we have transformed our state with record investments in infrastructure, especially at our airports. This latest plan for the modernization of JFK will build upon our efforts to improve the transportation network of this world-class facility, and enhance the traveler experience." The Governor's JFK Vision Plan, initially unveiled in January 2017 and based on the recommendations from the Governor's Airport Advisory Panel, calls for an overhaul of the airport's hodgepodge of eight disparate terminal sites into one unified JFK Airport by demolishing old terminals, utilizing vacant space, and modernizing on-airport infrastructure, while incorporating the latest in passenger amenities and technological innovations. The Vision Plan also calls for increasing the number and size of gates, improving parking availability, an array of airside taxiway improvements to allow for bigger planes and reduced gate congestion, upgrading the AirTrain JFK system to handle increased passenger capacity, and enhanced roadways on and off the airport. This includes better access to JFK from regional roadways, particularly the Van Wyck Expressway and the Grand Central Parkway, including the Kew Gardens Interchange. Today's announcement follows the selection in September 2017 of a master planning team for the redevelopment of the airport, led by Mott MacDonald and Grimshaw Architects, and whose portfolio of prior master planning and redevelopment projects includes airports in London, Singapore, Hong Kong, South Korea, Germany, the Netherlands, Canada and Australia. Starting late last year, the Port Authority of New York and New Jersey, which oversees JFK Airport, embarked on an extensive and rigorous process with the airport's existing six terminal operators—each of which operates under a long-term lease agreement—seeking proposals from each of them to modernize, expand and/or replace their facilities. These proposals were in turn evaluated by a formal comparative analysis team, comprised of seasoned experts, against a set of established criteria to determine the best combination of developments that would achieve the core master plan objectives, as well as fully leverage the Port Authority's previously approved $1 billion capital plan commitment. The plans for the two terminals announced today will now be submitted to the Port Authority's Board of Commissioners. Once lease terms are finalized, the leases will be subject to final Board approval. Additional discussions with multiple other airlines and terminal operators remain ongoing to further advance the goals of the Vision Plan. The new passenger facilities will feature significantly larger waiting areas with high ceilings, natural light and modern architecture coupled with interior green space, exhibits and art featuring iconic New York landmarks and local artists. World-class retail, restaurants and bars will include locally-based restaurateurs, craft beverage options and Taste NY stores. Free, high-speed Wi-Fi and an abundance of charging stations throughout the terminals will enable passengers to stay connected at each step of their journey. State-of-the-art technological improvements will be part of the terminal upgrades, with security enhancements - such as radiation detection and next-generation identification of unattended packages. At the center of the airport, the Port Authority will seek proposals to develop the new Kennedy Central hub, issuing a Request for Information in the coming months to determine the most effective and functional way to leverage this blank canvas in a fashion that will complement and add value to airport experience. Options might include, but aren't limited to, public open and recreational space, conference centers, cultural uses and other amenities for the traveling public and the airport's workforce. Two new centrally-located JFK Welcome Centers will serve as convenient access points for taxis, buses, for-hire vehicles and parking. The proposed new $7 billion, 2.9 million square foot terminal on the airport's south side will be developed by the Terminal One Group, a consortium of four international airlines—Lufthansa, Air France, Japan Airlines and Korean Air Lines. The plans call for replacing JFK's Terminal 1 (20 years old and undersized), which the group currently operates, and Terminal 2 (56 years old and functionally obsolete), as well as the area left vacant when Terminal 3 was demolished in 2014. The new terminal will contain at least 24 security screening lanes, over 230,000 square feet of retail, dining and other concessions, 116,000 square feet of airline lounges, and 55,000 square feet of interior green space, children's play areas and cultural exhibits. The complex will be operated by Munich Airport International and also be connected to the existing Terminal 4, which initially opened in 2001 and has been expanded twice since then, most recently in 2013. On the airport's north side, the proposed new $3 billion, 1.2 million square foot terminal will be developed by JetBlue. JetBlue plans to demolish Terminal 7 (48 years old, undersized and functionally obsolete) and combine it with the vacant space where Terminal 6 was demolished in 2011 to create a world-class international terminal complex that would be connected to the airline's existing Terminal 5 and be occupied by the airline and its various partners currently spread throughout the airport. Terminal 5 opened in 2008 and is the newest of JFK's current six terminals. Construction is expected to begin in 2020 with the first new gates opening in 2023 and substantial completion expected in 2025. An additional $2 billion in private non-Port Authority funding will be allocated to an array of critical infrastructure upgrades laying the foundation for these world-class new terminals. "World-class terminals and best-in-class customer service will go hand-in-hand at John F. Kennedy International Airport under Gov. Cuomo's leadership," said Port Authority Executive Director Rick Cotton. "The reimagined, modernized JFK Airport will be the gateway that New Yorkers deserve, enabling continued passenger growth in the decades to come." JFK Airport is one of the region's most powerful economic engines, supporting roughly 300,000 jobs that pay $16.2 billion in wages annually while generating $45.7 billion in yearly sales. The airport set a record with nearly 60 million passengers in 2017 and is projected to eclipse 75 million passengers by 2030. Together, the new terminals are estimated to create over 9,600 direct jobs, including construction jobs and over 15,000 total jobs over the life of the project. Outside of the terminal buildings at JFK there is also a need to simplify the spaghetti-like roadway system and enable quicker access to all terminals for private cars, taxis, ride-share and other for-hire vehicles, as well as reconfigure parking lots to ensure short-term and long-term options are more easily accessible. Plans call for the terminal areas to be linked by two main "ring roads," a north loop and a south loop, which will make it easier to enter and exit the airport while providing significantly easier access to the terminal complex areas on the airport's north and south sides. Off airport, the New York State Department of Transportation has targeted $1.5 billion in highway improvements designed to ease bottlenecks, particularly at the Kew Gardens Interchange with the Van Wyck Expressway and on the notoriously congested Van Wyck as well. The goal is to help reduce travel times for vehicles between midtown Manhattan and the airport. Construction is slated to begin later this year on improvements to eliminate bottleneck conditions at the Kew Gardens Interchange - originally built in the 1930s - with the Grand Central and the Van Wyck Expressway. It still contains a series of ramps that do not meet today's standards, and the improvements are expected to be complete by the end of 2022. On the Van Wyck itself, the 4.3-mile trip between the Kew Gardens Interchange and JFK airport can take more than a half hour during peak times. To improve the situation, the DOT is planning to build a fourth lane in both directions, which would be restricted to passenger vehicles with three or more people and for-hire-vehicles with at least one passenger. The environmental approval process is underway and expected to conclude in early 2019, with construction slated to begin in late 2019 and finished by end of 2024. With respect to mass transit, the Port Authority will be adding 50 percent capacity to the AirTrain JFK system as well as increasing frequency of service to keep up with rising demand. More than 7.6 million paid passengers used the system in 2017, with another 12.6 million more riding it to connect between terminals and access ground transportation. Additionally, at Jamaica Station the Long Island Rail Road is constructing a new, 12-car platform that will increase capacity for those traveling to and from JFK. The Governor also announced the creation of the JFK Redevelopment Community Advisory Council, composed of elected officials, community boards, nonprofit organizations, civic organizations and clergy leaders. The Council will be chaired by Queens Borough President Melinda Katz and U.S. Congressman Gregory Meeks, and will work with the Port Authority to expand community outreach efforts that are already underway, ensuring this ambitious project solicits ongoing feedback from local stakeholders as well as provides meaningful opportunities for local businesses, MWBE businesses and jobseekers. This includes a commitment to the Governor's nation-leading goal of 30 percent utilization of MWBEs, which applies to contracts as well as financing interests. A community office for the project will open in Jamaica, Queens later this fall, providing easier access for firms looking for business opportunities as well as local residents in search of jobs. Robin Hayes, JetBlue Chief Executive Officer said, "As New York's Hometown AirlineTM, JetBlue has been doing its part to transform JFK Airport since our first flight 18 years ago. Building on the success of JetBlue's award-winning JFK Terminal 5, we look forward to creating a more unified world-class airport experience across Terminals 5, 6 and 7 and achieving Governor Cuomo's vision for a transformed experience at JFK." Arthur Molins, Managing Director of the Terminal One Group, said, "We are extremely grateful for the support of the Governor and Port Authority as we partner with them to return JFK Airport to world-class status. We look forward to bringing this vision to reality." Congressman Gregory W. Meeks said, "Today's announcement by Governor Cuomo is a welcome development that speaks to his administration's leadership. The transformation of JFK into a state-of-the-art international airport for the 21st century is closer than we can imagine, and will be inclusive in ways that are crucial to the success of the project and the advancement of the community. This massive project will create regional job growth, especially in Southeast Queens and surrounding communities, as well as new business ventures for qualified MWBEs." Queens Borough President Melinda Katz said, "The $13 billion overhaul of John F. Kennedy will be instrumental in assuring continued economic growth and development across Queens. A project of this magnitude will bring many opportunities to the community of Southeast Queens, as well as encouraging additional investment from the state." Senator James Sanders Jr. said, "The redevelopment of JFK has the potential to provide many great opportunities, and I want to make sure that those opportunities are also reaped by those who live closest to the airport. We look forward to a Community Benefits Agreement that solidifies the state's commitment to the residents of Southeast Queens, and we are delighted by the 30 percent goal for Minority and Women-Owned Enterprises (MWBE) contracting and look forward to helping the Governor and the Port Authority reach that goal." Senator Joseph P. Addabbo, Jr. said, "As the busiest airport in New York City, the demand for an airport that can accommodate the record-setting numbers of passengers each year is high, and this investment is precisely what is needed to make that vision a reality. These upgrades will make a real difference in the lives of New Yorkers who frequent JFK, and for visitors whose first impression of the state is the moment they step off the plane. I have lived near the airport all my life and understand it's importance to our local economy and job growth. I applaud Governor Cuomo for staying true to his promise to improve our infrastructure and grow New York's economy." Senator Todd Kaminsky said, "The new JFK, with the addition of two new world-class terminal spaces, promises an improved traveler experience, with better access to airlines, terminals, and public transportation. As one of our busiest airports, these improvements are critical to the airport's transformation and I thank Governor Cuomo for getting it done with 90 percent private investment, saving taxpayer dollars in the process." Assembly Member Alicia Hyndman said, "Governor Cuomo has consistently made significant investments in New York's infrastructure, and he has continued that with today's JFK announcement. We are pleased That this transformative plan will provide New York with the world-class airport that it deserves. I commend Governor Cuomo for his commitment to our community directly affected by this redevelopment. I look forward to upgraded infrastructure, and look forward to seeing the new JFK." Assembly Member Clyde Vanel said, "The JFK Vision Plan to create unified, interconnected terminals on the north and south sides of this gateway airport is critical to revolutionizing the way travelers experience their visits to or departures from New York. This is key to not only bolstering New York's economy, but to attracting travelers and visitors to the state to experience this world-class transportation hub for generations to come." Assembly Member Michaelle C. Solages said, "This exciting announcement is critical to bringing the region's infrastructure into the 21st century, accommodating the dramatic growth this airport sees each year. The transformational plan will keep New York's economy moving forward in the decades ahead." Mario Cilento, President of the New York State AFL-CIO said, "The governor's historic investment will not only transform John F. Kennedy Airport into a world-class transportation hub, it will create hundreds of good-paying union construction jobs. This is exactly the type of commitment we need to help support working families, grow the middle class and boost our economy." Gary LaBarbera, Building & Construction Trades Council of Greater NY President said, "JFK's redevelopment is central to providing a world-class customer experience. With more than 60 million passengers traveling through JFK each year, the airport needs an overhaul. Airport access, terminals, roadways, and cargo facilities will receive the attention they need to make JFK the world-class facility it should be, while creating good union construction jobs for hardworking New Yorkers and building a strong middle class." Héctor Figueroa, 32BJ SEIU President said, "Coming on the heels of the Port Authority's historic vote to enact a $19 minimum wage, Governor Cuomo's JFK announcement represents another historic investment in our airports. Not only will the JFK Redevelopment plan improve the travel experience for those traveling to New York by offering world-class amenities, it will provide significant job and business opportunities for the residents of Southeast Queens. This $13 billion renovation will transform JFK into a world-class, 21-century facility." Stuart Appelbaum, RWDSU President & Vice Chair Global Gateway Alliance said, "The way JFK is currently configured doesn't work -- terminals were built as needed over the last 70 years, creating a divided airport. As JFK continues to move closer to capacity, it is essential that we offer better access to terminals, and provide a more unified design to the airport overall." George Miranda, Chairman, International Brotherhood of Teamsters Airline Division said, "The JFK Vision Plan will transform JFK into a unified, interconnected, world-class airport. It is clear these improvements on the airport's north and south sides are essential in order to handle the expected growth in passengers over the next 30 years." Partnership for New York City President and CEO Kathryn Wylde said, "JFK has long been the dreaded airport in New York, with outdated amenities, confusing navigation, and challenging access from the outside. This investment is an unprecedented commitment to modernizing our infrastructure and ensuring that New Yorkers and visitors will have the 21st century travel experience they have come to expect. I commend the Governor for his leadership on this project and for continuing to invest in the future of New York." 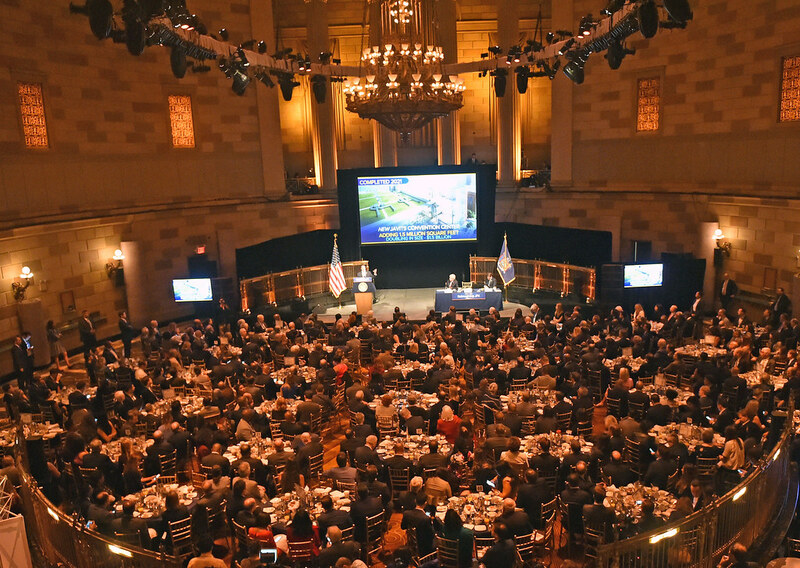 Carlo A. Scissura, Esq., President and CEO, New York Building Congress said, "Under Governor Cuomo's leadership, New York is building bigger and better than ever before. The transformational redevelopment of JFK will support economic growth, create jobs and deliver a world-class airport of the caliber that New Yorkers deserve. I applaud Governor Cuomo for his vision and leadership."